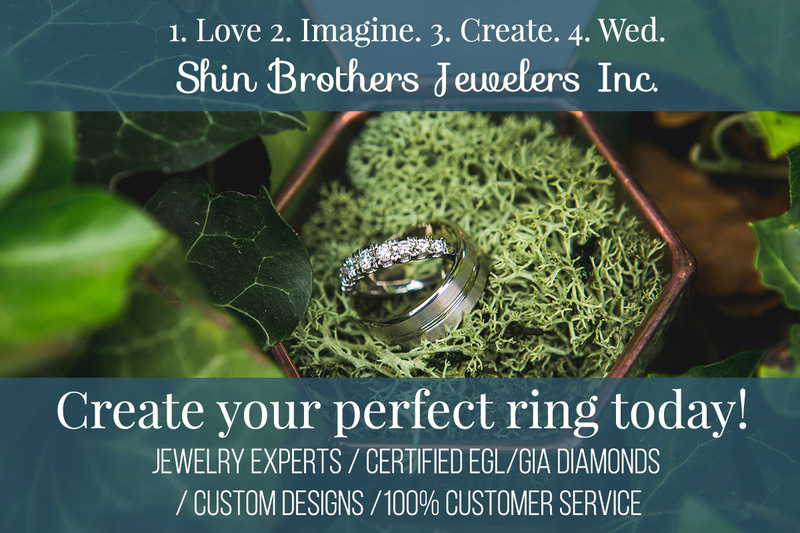 Shin Brothers Jewelers Inc. has created thousands of custom designs for over 30 years. We understand this is significant decision to make. We have catered to thousand of people but treat every one of them like they are our family or best friend. Our employees are experts with years of experience in educating you on making your second best move (you already decided on your first!). Right when you step in our door, we offer you an expertise in rings with intentions to let YOU decide. We have confidence in the quality of our products and our prices! I have an idea of things I want in my ring. What do I do now? Yes! That is GREAT! We love to inspire, collaborate, and make one-of-a-kind pieces. We encourage our clients to bring in sketches, pinterest photos, magazine clippings, anything that catches your eye in regards to design, and then we work together on creating something you'll love! We have design experts here that will help shape your thought into reality. 2. After some time looking, if you're not set on a design, give it time. It's not a short and quick process. 3. Feel free to email us at shinjewelers@gmail.com for any thoughts/clippings of things you love! We'll know you by your first name, so don't worry about getting lost as a number. 4. Get the creative process started with us, and let's get to work (while having some fun)!